An unsteady Democratic Party presidential nominee Hillary Clinton was filmed gingerly descending a set of stairs in New York City’s Flatiron district Sunday afternoon. 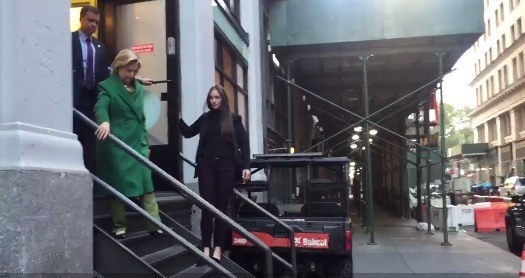 The video, taken and posted to Twitter by ABC News’ Liz Kreutz shows Clinton, wearing a heavy green overcoat in low-70 degree weather (no one else is seen wearing an overcoat), exit a door grasping the door handle while cautiously looking down at the steps. Clinton then steps over to the side of the stairs and grabs hold of the banister with her right hand and gingerly walks down the seven stairs to the sidewalk. The man walking directly behind Clinton bounds down the short flight of steps without using the banisters. Clinton at first ignores Kreutz calling out a question about being ready for the debate as she focuses on the stairs. Clinton then lights up when she recognizes Kreutz and the two exchange quick greetings with Kreutz again asking about the debate as Clinton approaches her black Secret Service van. Clinton replies she is, “getting ready, getting ready!”. Clinton then reaches out and grabs a handle in the vehicle to steady herself as she steps down off the curb to the gutter and then uses both arms to pull herself up into the van. The video clip ends at that point. Clinton appears to be taking extra care to ensure she does not fall down again in public. Before her visit to "Apple Seeds," Clinton stopped by Chelsea Clinton's Flatiron apartment, per sources. She now has a meeting w Netanyahu. UPDATE: Mike Cernovich noticed this disturbing video earlier today.